NOTE: This letter from KFMC President James F. Beattie, M.D., appeared in the 2016 KFMC Annual Report. Articles from the report can be accessed below. The Kentucky Foundation for Medical Care (KFMC) strives to meet its stated purpose – Improving the health of all Kentuckians through medical education and public health initiatives. In 2015-16, the Foundation focused on training for physicians that advanced public health, as well as a successful public health campaign targeting smoking cessation. The Foundation was a prime sponsor, through a grant from the Physicians Foundation, of the Kentucky Physicians’ Leadership Academy at the 2015 KMA Annual Meeting. As you’ll learn from the 2016 Annual Report, physicians in attendance deemed it a great success. We built on that success through a Local Physicians Leadership Symposium held in April in London, through a partnership with KentuckyOne Health. That’s why the Foundation is once again sponsoring leadership training at the 2016 KMA Annual Meeting and is expanding our support of physician leadership through programs offered by KMA for practicing physicians, as well as medical students. The KMA Community Connector Leadership Program offers training to practicing physicians and works to connect them to leadership opportunities in their communities. The Medical Student Outreach and Leadership Program, or MSOLP for short, offers similar opportunities for medical students. Included in that program is a series of “Lunch and Learns” that focus on the business of medicine, medical advocacy and other topics. These programs will now fall under the LEED program sponsored by the KFMC. The Leadership in LEED focuses on Education, Experience and Development of physician leaders. Also included will be a new Kentucky Physicians Leadership Institute, which will offer a deeper dive into leadership development of practicing physicians through four weekends of leadership training. The Institute will focus on a small class of 15 participants and will include lessons in the business of leadership, personal leadership, advocacy and leadership in action. The Kentucky Physicians Leadership Academy held at the KMA Annual Meeting will be the culminating event for those participants. That session, as always, will be open to all Annual Meeting attendees. This year, the KFMC worked with KMA and other health care stakeholders across Kentucky on the public health campaign, Commit to Quit, which encouraged smokers to work with their physicians when they are ready to quit. Studies show smokers who involved their physicians in their cessation efforts have a higher rate of success than those who don’t. The successful campaign engaged partnerships with local medical societies, as well as large health groups across the state. We are working on a new campaign for the coming year and expanding our focus on leadership development and training. Thank you to all the listed donors. As physicians, we know we face tremendous challenges in achieving our goals of improving the health of Kentuckians. Your gifts have helped us to provide programs and education on the myriad of health care challenges we face. We could not achieve our goals without your support. There’s WASTE—4 to 6 million tons of medical waste is created each year; 85 percent is reusable. There’s WANT—6 to 10 million children worldwide will die before their fifth birthday due to lack of access to health care. Then there’s a SOLUTION—MSROs, or Medical Surplus Recovery Organizations. In Kentucky, that’s Supplies Over Seas (SOS), a Louisville-based nonprofit that gathers medical surplus throughout the commonwealth, as well as southern Indiana and southern Ohio, and matches it to medical needs around the world. There are only 15 MSROs across the country. The Kentucky Foundation for Medical Care last year awarded a $3,000 Community Connector grant to SOS for equipment and batteries to test medical surplus items to ensure their usability. The organization is connected to Gordon Tobin, MD, of Louisville, a 2014 KMA Community Connector. The Foundation awards grants annually to organizations that have connected to graduates of the program. 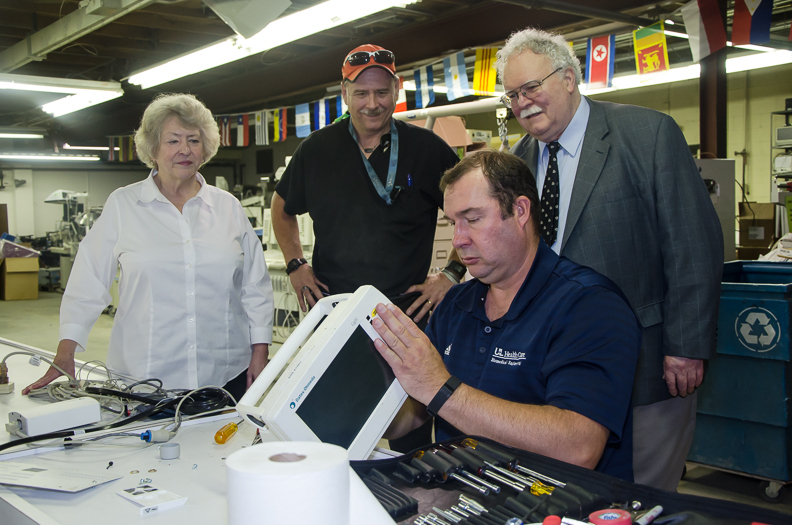 Melissa Mershon, president and CEO of Supplies Over Seas, said without the ability to test equipment, SOS couldn’t provide some much-needed items for health systems that need them. The organization received 153 tons of medical waste in 2015, up from 64 tons in 2011. That includes medical equipment like hospital beds and incubators, as well as dry goods like bandages and tools. Volunteers sort the items and/or determine whether they are usable. For larger medical equipment, biomedical engineers must test to determine whether it is useable. KentuckyOne Health Care provides time for its biomedical engineers to volunteer, and University of Louisville biomedical engineering students come in regularly to help test the large equipment. “Like the Goodwill, not every donation is a good donation,” Mershon said. Usability could be determined by whether the equipment has been recalled, whether consumables needed in the equipment are available, and whether the equipment works. SOS uses a color-coded system of green, yellow and red; green if it’s good to go, yellow if it’s workable and needs something simple to make it work and red if the equipment is something many people need but a particular piece is only good for parts. In its 23 years in existence, SOS has met medical needs around the world, from places like Haiti and Uganda to Jamaica and Mexico. Supplies go out the door in everything from a suitcase to a box, a pallet or a shipping container. Physicians going on mission trips can contact SOS for needed supplies. For those who cannot visit the SOS Medical Team “Store,” SOS will pack and ship custom boxes. SOS offers custom-packed shipments for groups planning large-scale projects or for clinics and hospitals abroad in need of supplies. SOS also ships 40-foot cargo containers filled with medical supplies and equipment to hospitals and clinics around the world. The supplies and equipment are donated by physicians and hospitals in the SOS service area. The volunteer time from groups, especially from the UofL students, leaves a mark on the Louisville community. She believes the grant will help SOS test many pieces of equipment. “The exponential good this grant will do for this organization is enormous,” she said. Death is never an easy topic. But it needs to be discussed—probably sooner than most people would like, said Starlette Fowler, RN, CHPN, provider liaison for Hospice of the Bluegrass Northern Kentucky. Oftentimes, that is not the case. That’s why Hospice of the Bluegrass will host the Carroll County Conversation Project Sept. 8 at General Butler State Park in an effort to encourage the community to have those conversations about what they want at end of life. The Kentucky Foundation for Medical Care provided a $1,900 grant for the project. “The goal of the project is to educate but also to empower members of our community to plan while they can,” Fowler said. The targeted group is women ages 40 to 65, primarily because they are often the people making plans for family members, whether it be a parent, a spouse or a child. These conversations ensure those decisions are in line with the patient’s wishes. “Your family is not left wondering if they did the right thing,” she said. Fowler knows how difficult those conversations can be. She tried to begin the conversation about what she would like in the event of her death. Her mother wouldn’t talk to her about it. As a nurse, she saw many instances where health care providers and families tried to do everything in their power to save patients, oftentimes putting off a necessary discussion that would alleviate stress and depression down the road, Fowler said. The decisions aren’t limited to funeral service wishes. Fowler said some patients require decisions about medical care, such as to what extent the person wants a medical team to go and how long they should continue if something isn’t working. She said physicians play an important role in end of life care, whether it be providing medical care they give or recognizing when it’s time to move to the next phase and referring patients to Hospice or following their wishes on the degree to which they go to extend the patient’s life. As health care continues to evolve, physicians are called on more and more to serve in leadership roles in medical practices, on committees, in large health systems, and in administration positions at hospitals and hospital groups. The Kentucky Foundation for Medical Care is focusing on this need for physician leadership training through its new LEED initiative – Leadership through Education, Experience and Development. LEED will encompass the KMA Community Connector Leadership Program (CCLP), launched in 2013, the Medical Student Outreach and Leadership Program (MSOLP), launched in 2015, and the Kentucky Physicians Leadership Academy, launched at the 2015 Kentucky Medical Association Annual Meeting. It will also include the new Kentucky Physicians Leadership Institute (KPLI), which will launch in 2017. The KMA leadership programs offer such opportunities. CCLP is an opportunity for physicians to enhance their leadership skills through education and direct community involvement. Community Connectors are physicians who are engaged in their communities in an effort to promote KMA policies and the practice of medicine in Kentucky by working with business, government and civic leaders. The MSOL Program is designed to promote community involvement among medical students, as well as give them an opportunity to learn more about the political, social and economic issues in the health care system. The Kentucky Physicians Leadership Academy, open to all KMA members, is a daylong session focused on leadership during the KMA Annual Meeting. The KPLI is a deeper dive into leadership skills and will include four weekends of leadership training focused on personal leadership skills, business leadership and advocacy. It will culminate with the Kentucky Physicians Leadership Academy at the KMA Annual Meeting. To learn more about the leadership programs offered through the KFMC and KMA, visit www.kyma.org or www.kyfmc.org. Dr. Kevin Pho, MD, founding editor of KevinMD.com, told Kentucky physicians last year that social media has its risks, but it can play an important role in communications with their patients. “The biggest risk to social media is not using it at all in health care,” Dr. Pho, an internal medicine physician and social media expert, told attendees at the first Kentucky Physicians Leadership Academy at the 2015 KMA Annual Meeting. The event, sponsored by the Kentucky Foundation for Medical Care through a grant from The Physicians Foundation, had the highest attendance of similar leadership seminars held on a single day. His talk had an impact on physicians in attendance. “After attending Dr. Pho’s session, I became much more aware of the potential uses and positive influences of social media in health care delivery,” said Daley Toney, MD, of Lexington. Dr. Pho discussed how physicians can make a difference in health care with social media. It proved to be a timely topic considering reimbursement issues facing physicians and the growth in popularity of social media. According to estimates, the number of worldwide social media users reached 1.96 billion and is expected to grow to 2.5 billion by 2018, according to Statista, a statistics portal for market research. KMA is one indicator of growth, having more than tripled social media followers over the past year. Other speakers at the Leadership Academy shared insights into the challenges facing health care in Kentucky. They included John Langefeld, MD, chief medical officer for the Kentucky Department of Medicaid Services, Alison Davis, PhD, professor at the University of Kentucky and executive director of the Community and Economic Development Initiative of Kentucky, Richard E. Wild, MD, chief medical officer of the Atlanta Regional Office of the Centers for Medicare and Medicaid Services, Nancy Wiser, president of Wiser Strategies, and Brock Slabach, MPH, senior vice president at the National Rural Health Association. KMA’s Leadership Academy was well-received. “I love the idea of developing physician leadership,” said Linda Gleis, MD, of Louisville. Attendees at the leadership academy at the KMA Annual Meeting could apply for funding to hold a Local Physicians Leadership Symposium, also funded through the KFMC with funds from The Physicians Foundation grant. That symposium was held in April in London. Building on the success of the 2015 Kentucky Physicians Leadership Academy, the Kentucky Foundation for Medical Care will once again sponsor leadership training for KMA members during the 2016 Annual Meeting. The theme, “Wellness in a Weekend,” focuses on ways physicians can work to improve their communities, as well as their own health, create a better patient experience and improve professional satisfaction. Tony Buettner, Project Manager with Blue Zones, an organization that helps people live longer, better lives, will discuss the “Blue Zones Project,” a three- to five-year initiative designed to make healthy choices in a community easier through permanent changes to environment, policy and social networks. Buettner’s presentation, “The Blue Zones: Secrets of a Long Life,” will reveal the common lifestyle and cultural traits of the longest-lived and healthiest places in the world. His presentation will focus on ways to redesign a medical practice to minimize stress and reignite professional fulfillment in a short amount of time. His topic is AMA’s STEPS Forward™ initiative, a practice-based initiative aimed at helping physicians meet the Quadruple Aim—better patient experience, better population health and lower overall costs with improved professional satisfaction. “One of most important things we think physicians can do is to get together with their practice leadership, step back, and ask—‘how are things working?’” said Dr. Bagley. With today’s continually evolving health care environment, physicians are struggling to spend more quality time with their patients to ensure they receive the highest care. It’s not just adults who are working to improve their communities. Students at Middlesboro Elementary School in Bell County worked diligently to get a public smoking ban passed in their community a few years ago. She had the opportunity to make a difference through a “Destination Imagination Team” as a fourth grader at Middlesboro Elementary School in 2014. The seven students on the team were selected based on a variety of assessments used throughout the school and district. “The mission of the team was to develop opportunities that inspire the global community of learners to utilize diverse approaches in applying 21st century skills and creativity,” said teacher Kelsey Massengill, who helped guide the students on the team. But Massengill is quick to point out she only served as a coach to ensure the students stayed on track — she didn’t directly help them with their ideas or project. Students picked the challenge of a service learning project. “One of the guidelines was the project had to be something the students viewed as a concern within their community,” Massengill said. To the students, that concern was smoking. Chloe and other students from the team will discuss how they worked to get the Middlesboro City Council to pass the ban. Classes in medical school focus primarily on the clinical nature of medicine. Leadership training goes beyond that. Rajagopal is an active participant in KMA. In addition to her service on the Board, she will serve as the University of Kentucky’s MSS delegate to the 2016 KMA Annual Meeting. She also attended the AMA Annual Meeting two years ago. The Kentucky Medical Association’s new leadership program—Medical Student Outreach and Leadership Program—gives them the chance to do just that. Part of the MSOL Program’s requirements include attendance at a series of “Lunch and Learn” presentations aimed at helping medical students prepare for the challenges facing them in their professional careers. Throughout the year, KMA representatives met with medical students from both UK and the University of Louisville to conduct a series of four educational seminars at each university. Seminar topics included political, social and economic issues in the health care system. Specifically, KMA staff provided an overview of the medical industry, health and marketplace in Kentucky; an overview of the legislative process, along with information on the importance of state legislative activity for medical students, residents and practicing physicians; an overview of the health care finance system, including the basics of Medicare, Medicaid and physician reimbursement for services; and an overview of employment contracting issues. “A lot of the topics presented were concepts that we were always wondering about, but were too busy to go looking for ourselves. Having a neutral party who absolutely knew what they were talking about was extremely valuable to us,” Ruberg said. The Kentucky Foundation for Medical Care will sponsor the second year of the KMA “Lunch and Learn” series of talks, as well as the Medical Student Outreach and Leadership Program. The Kentucky Foundation for Medical Care and the Kentucky Medical Association have some advice for smokers who are striving to finally put smoking on pause for good–talk to your physician to help you find success. For the past year, KMA and KFMC have teamed with local county medical societies and other health care partners to help smokers Commit to Quit through a public health campaign that focuses on the critical relationship between patient and physician. KMA, KFMC and their partners launched the campaign in early January 2016. Studies show that as many as seven in 10 smokers want to quit; physicians can help them find the right path. When smokers work with their physician, they are more likely to be successful. In fact, the long-term rate for abstaining from smoking jumped from 7 percent to 30 percent when smokers seek help from their physician, a 2007 report from the Association of American Medical Colleges found. Smoking is the leading cause of cancer in the United States, and tobacco use increases the risk of many causes of cancer. In Kentucky, 30 percent of adults and 14 percent of teens self-report as smokers. The commonwealth leads the nation in the number of cancer deaths, according to the Centers for Disease Control and Prevention. Smoking also contributes to other health problems, including heart disease, stroke, emphysema and bronchitis. When people quit smoking, their health improves almost immediately. According to the American Heart Association, a smoker’s blood pressure and heart rate recovers from the cigarette-induced spike in only 20 minutes after quitting. Within 12 hours, the carbon monoxide levels in a smoker’s blood return to normal. One week after quitting, clear and deeper breathing gradually returns and circulation and lung function begin to improve in as short as two weeks.